Early last month I watched the late Prof. Ediriweera Sarathchandra's Hasthikaantha Mantharey at the Lionel Wendt. Directed by Lalitha Sarathchandra, this delightful production designed on classical forms of theatrical expressions is a must watch for aspiring thespians and will prove worthy to school children to develop appreciation for the classics of Sinhala theatre. It opens with something like an overture with verse and a dance by a performer, in certain respects stylised by gestures and movements, to represent an elephant. 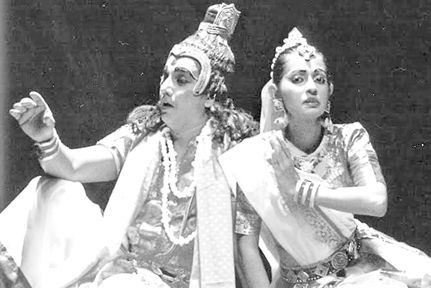 Stagecraft is patently minimalist and is in keeping with the traditions of classical traditional Sinhala theatre. The resplendent finery certainly adds an element of attractiveness evoking the images of olden times. Acting overall was commendable. The story is set in ancient Bharatha deshaya (pre British India in land extents as per Buddhist and Vedic scriptures). King Chandapachopa, who is power hungry to reign over all of Bharatha, wages war on King Udena, who is believed to possess a mystical spell unknown to the learned Brahmins, who are advisors in the royal court. This spell is a mantra called the Hasthikaantha mantharaya the effects of which are unknown until war is waged. It subdues the cavalry of war elephants deployed by the invading king and draws the elephants over to the side of the defending king's army. A 'Trojan horse' strategy is later devised thereafter with a mechanical elephant, and King Udena is finally captured. The captive king is unrelenting about his refusal to teach his captor the secret mantra but is negotiated into teaching it to a 'suitable candidate' who will appreciate its aesthetic musicality. What ensues is a classic scenario where love at first sight occurs between King Udena and the Princess Vasuladaththa, an accomplished songstress, and incidentally King Chandapachopa's daughter! Finally the warmongering King realises his excessive greed had lost him his daughter -who elopes with the captured King - while also not being successful in obtaining the secret mantra, for which he waged war. The importance of elephants in ancient India cannot be overstated. They were crucial to economic, military, religious/cultural affairs. Chanakya Kautilya, the legendary political advisor/strategist and exponent on statecraft in ancient Bharatha, who was instrumental in enthroning Emperor Chandragupta and the consequent founding of the Maurya Dynasty, is believed to have established laws that decreed the killing of an elephant to be an offence carrying the death penalty. The advance of Alexander the Great and his ambitions beyond the victory of the Hydaspes (after he defeated King Porus), was believed to have been discontinued upon learning of the massive arsenal of war elephants possessed by the Nanda empire, the principal power in the Indian subcontinent at the time. Therefore, on one hand what this play speaks of is how a creation of nature -the elephant - was seen in the light of an unparalleled force of power and wealth in ancient times of the Indian subcontinent and what lengths kings would go to obtain or protect secrets that would grant mastery over commanding elephant cavalries. And while in the midst of power struggles where kingdoms and the lives of kings are at stake, the beauty of love and its destinies too can manifest in the most unexpected of circumstances.